Paddy Carr, Cathal Corey and Anthony Harkin are also in contention for the role following today’s 5pm deadline. Rory Gallagher was previously the Donegal assistant manager. AT LEAST FOUR hopefuls have been nominated for the vacant managerial position with Donegal’s senior footballers following today’s 5pm deadline. In the wake of Jim McGuinness’s departure, the Donegal County Board has confirmed that all nominations will be kept confidential, although four have made the public domain including that of the favourite to land the job — Rory Gallagher. A native of Belleek, Co Fermanagh, Gallagher lives in Killybegs and was McGuinness’s No 2 from 2011 until last year. The former Fermanagh and Cavan footballer, who won the 2010 All-Ireland club championship with St Gall’s of Antrim, was nominated by the Kilcar club, where he is the current joint-manager with John McNulty. Fanad Gaels and Naomh Conaill this week made it known they had nominated Paddy Carr and Cathal Corey respectively. Late on Friday evening it emerged that Ardara had nominated Anthony Harkin. Carr is a native of Fanad and lined out for Donegal seniors in the 1980 Ulster championship against Tyrone. The school teacher, based in Navan, Co Meath, took Kilmacud Crokes to the 2009 All-Ireland club championship. He previously managed Louth and Meath minors and took Burren to last year’s Down county final, where they lost to Kilcoo, who won the title in the Mourne County for a third year in succession. Kildress, Co Tyrone native Corey joint-managed Naomh Conaill with McGuinness in 2009, where the pair guided the Glenties club to the Donegal SFC final only to lose to St Eunan’s of Letterkenny. 12 months later Corey’s Naomh Conaill went one better to win only a second-ever Donegal championship before losing to Crossmaglen Rangers in the Ulster club final. He has been in charge at Slaughtneil and Banagher in Derry since. Harkin is the current Coaching Officer within Donegal circles and was trainer under Brian McEniff when Donegal clinched Sam Maguire for the first time back in 1992. Nominations have also been made for the positions of Donegal U21 and minor managers, as both last year’s incumbents reached the end of their terms. Maxi Curran is in the running to continue his interest with the U21s after they reached this year’s Ulster final only to lose to Cavan. Declan Bonner, who took Donegal’s minor panel to a first-ever All-Ireland final this year at Croke Park, which ended in defeat to Kerry, has been nominated by numerous clubs but is understood to be considering his position. “We decided at the last meeting of the executive that we would keep all nominations confidential,” Donegal county secretary Aodh Mairtín O’Fearraigh said this evening. “Some names have crept into the public domain of their own accord, but our decision was to keep things in-house. Email “Rory Gallagher among four confirmed candidates for Donegal manager's job”. 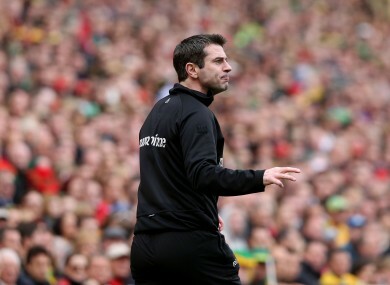 Feedback on “Rory Gallagher among four confirmed candidates for Donegal manager's job”.